This article is about historical uses of flags associated with the defunct Confederate States of America. For modern uses, see Modern display of the Confederate flag. Three horizontal stripes of equal height, alternating red and white, with a blue square two-thirds the height of the flag as the canton. Inside the canton are white five-pointed stars of equal size, arranged in a circle and pointing outward. A white rectangle two times as wide as it is tall, a red quadrilateral in the canton, inside the canton is a blue saltire with white outlining, with thirteen white five-pointed stars of equal size inside the saltire. Initial reaction to the second national flag was favorable, but over time it became criticized for being "too white." Military officers also voiced complaints about the flag being too white, for various reasons, such as the danger of being mistaken for a flag of truce, especially on naval ships, and that it was too easily soiled. The Columbia-based Daily South Carolinian observed that it was essentially a battle flag upon a flag of truce and might send a mixed message. Due to the flag's resemblance to one of truce, some Confederate soldiers cut off the white portion of the flag, leaving only the canton. In addition to the national flags of the Confederacy, a wide variety of flags and banners were flown by Southerners during the Civil War. Most famously, the "Bonnie Blue Flag" was used as an unofficial flag during the early months of 1861. It was flying above the Confederate batteries that first opened fire on Fort Sumter in Charleston harbor, in South Carolina beginning the Civil War. The "Van Dorn battle flag" was also carried by Confederate troops fighting in the Trans-Mississippi and Western theaters of war. In addition, many military units had their own regimental flags they would carry into battle. Flag of the Army of Northern Virginia or "Robert E. Lee Headquarters Flag"
The "Sibley Flag", Battle Flag of the Army of New Mexico, commanded by General Henry Hopkins Sibley. At the First Battle of Manassas, near Manassas, Virginia, the similarity between the "Stars and Bars" and the "Stars and Stripes" caused confusion and military problems. Regiments carried flags to help commanders observe and assess battles in the warfare of the era. At a distance, the two national flags were hard to tell apart. In addition, Confederate regiments carried many other flags, which added to the possibility of confusion. After the battle, General P. G. T. Beauregard wrote that he was "resolved then to have [our flag] changed if possible, or to adopt for my command a 'Battle flag', which would be Entirely different from any State or Federal flag." He turned to his aide, who happened to be William Porcher Miles, the former chairman of the Confederate Congress's Committee on the Flag and Seal. Miles described his rejected national flag design to Beauregard. Miles also told the Committee on the Flag and Seal about the general's complaints and request that the national flag be changed. The committee rejected the idea by a four-to-one vote, after which Beauregard proposed the idea of having two flags. He described the idea in a letter to his commanding General Joseph E. Johnston: "I wrote to [Miles] that we should have 'two' flags—a 'peace' or parade flag, and a 'war' flag to be used only on the field of battle—but congress having adjourned no action will be taken on the matter—How would it do us to address the War Dept. on the subject of Regimental or badge flags made of red with two blue bars crossing each other diagonally on which shall be introduced the stars,... We would then on the field of battle know our friends from our Enemies." The flag that Miles had favored when he was chairman of the "Committee on the Flag and Seal" eventually became the battle flag and, ultimately, the most popular flag of the Confederacy. According to Museum of the Confederacy Director John Coski, Miles' design was inspired by one of the many "secessionist flags" flown at the South Carolina secession convention in Charleston of December 1860. That flag was a blue St George's Cross (an upright or Latin cross) on a red field, with 15 white stars on the cross, representing the slaveholding states, and, on the red field, palmetto and crescent symbols. Miles received a variety of feedback on this design, including a critique from Charles Moise, a self-described "Southerner of Jewish persuasion." Moise liked the design but asked that "...the symbol of a particular religion not be made the symbol of the nation." Taking this into account, Miles changed his flag, removing the palmetto and crescent, and substituting a heraldic saltire ("X") for the upright cross. The number of stars was changed several times as well. He described these changes and his reasons for making them in early 1861. The diagonal cross was preferable, he wrote, because "it avoided the religious objection about the cross (from the Jews and many Protestant sects), because it did not stand out so conspicuously as if the cross had been placed upright thus." He also argued that the diagonal cross was "more Heraldric [sic] than Ecclesiastical, it being the 'saltire' of Heraldry, and significant of strength and progress." According to Coski, the Saint Andrew's Cross (also used on the flag of Scotland as a white saltire on a blue field) had no special place in Southern iconography at the time, and if Miles had not been eager to conciliate the Southern Jews, his flag would have used the traditional upright "Saint George's Cross" (as used on the flag of England, a red cross on a white field). A colonel named James B. Walton submitted a battle flag design essentially identical to Miles' except with an upright Saint George's cross, but Beauregard chose the diagonal cross design. Miles' flag and all the flag designs up to that point were rectangular ("oblong") in shape. General Johnston suggested making it square to conserve material. Johnston also specified the various sizes to be used by different types of military units. 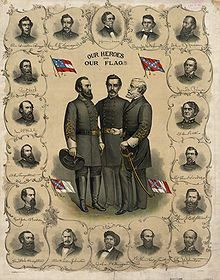 Generals Beauregard and Johnston and Quartermaster General Cabell approved the design of the 12-star Confederate Battle Flag at the Ratcliffe home, which served briefly as Beauregard's headquarters, near Fairfax Court House in September 1861. The 12th star represented Missouri. President Jefferson Davis arrived by train at Fairfax Station soon after and was shown the design for the new battle flag at the Ratcliffe House. Hetty Cary and her sister and cousin made prototypes. One such 12-star flag resides in the collection of Richmond's Museum of the Confederacy and the other is in Confederate Memorial Hall in New Orleans. On November 28, 1861, Confederate soldiers in General Robert E. Lee's newly reorganized Army of Northern Virginia received the new battle flags in ceremonies at Centreville and Manassas, Virginia, and carried them throughout the Civil War. Beauregard gave a speech encouraging the soldiers to treat the new flag with honor and that it must never be surrendered. Many soldiers wrote home about the ceremony and the impression the flag had upon them, the "fighting colors" boosting morale after the confusion at the Battle of First Manassas. From then on, the battle flag grew in its identification with the Confederacy and the South in general. The flag's stars represented the number of states in the Confederacy. The distance between the stars decreased as the number of states increased, reaching thirteen when the secessionist factions of Kentucky and Missouri joined in late 1861. The Army of Northern Virginia battle flag assumed a prominent place post-war when it was adopted as the copyrighted emblem of the United Confederate Veterans. Its continued use by the Southern Army's post-war veterans groups, the United Confederate Veterans (U.C.V.) and the later Sons of Confederate Veterans, (S.C.V. ), and elements of the design by related similar female descendants organizations of the United Daughters of the Confederacy, (U.D.C. ), led to the assumption that it was, as it has been termed, "the soldier's flag" or "the Confederate battle flag". The square "battle flag" is also properly known as "the flag of the Army of Northern Virginia". It was sometimes called "Beauregard's flag" or "the Virginia battle flag". A Virginia Department of Historic Resources marker declaring Fairfax, Virginia as the birthplace of the Confederate battle flag was dedicated on April 12, 2008, near the intersection of Main and Oak Streets, in Fairfax, Virginia. The fledgling Confederate States Navy adopted and used several types of flags, banners, and pennants aboard all CSN ships: jacks, battle ensigns, and small boat ensigns, as well as commissioning pennants, designating flags, and signal flags. The First Confederate Navy jacks, in use from 1861 to 1863, consisted of a circle of seven to fifteen five-pointed white stars against a field of "medium blue." It was flown forward aboard all Confederate warships while they were anchored in port. One seven-star jack still exists today (found aboard the captured ironclad CSS Atlanta) that is actually "dark blue" in color (see illustration below, left). The Second Confederate Navy Jack was a rectangular cousin of the Confederate Army's battle flag and was in use from 1863 until 1865. It existed in a variety of dimensions and sizes, despite the CSN's detailed naval regulations. The blue color of the diagonal saltire's "Southern Cross" was much lighter than the dark blue of the battle flag. The first national flag, also known as the Stars and Bars (see above), served from 1861 to 1863 as the Confederate Navy's first battle ensign. It was generally made with an aspect ratio of 2:3, but a few very wide 1:2 ratio ensigns still survive today in museums and private collections. As the Confederacy grew, so did the numbers of white stars seen on the ensign's dark blue canton: seven-, nine-, eleven-, and thirteen-star groupings were typical. Even a few fourteen- and fifteen-starred ensigns were made to include states that were expected to secede but never completely joined the Confederacy. The second national flag was later adapted as a naval ensign, using a shorter 2:3 ratio than the 1:2 ratio adopted by the Confederate Congress for the national flag. This particular battle ensign was the only example taken around the world, finally becoming the last Confederate flag lowered in the Civil War; this happened aboard CSS Shenandoah in Liverpool, England on November 7, 1865. For use of Confederate symbols in modern society and popular culture, see Modern display of the Confederate flag. An elongated (2:1 aspect ratio) version of the Battle Flag of the Army of Northern Virginia, and similar to The Second Confederate Navy Jack, in use from 1863 until 1865, although with the darker blue field of the Army's battle flag. Despite never having historically represented the Confederate States of America as a country, nor having been officially recognized as one of its national flags, the rectangular Second Confederate Navy Jack and the Battle Flag of the Army of Northern Virginia are now flag types commonly referred to as the Confederate Flag. Both have become a widely recognized symbol of the Southern United States. It is also known as the rebel flag, Dixie flag, and Southern cross and is sometimes incorrectly referred to as the Stars and Bars. The actual "Stars and Bars" is the first national flag, which used an entirely different design, and was in use by the Confederacy until mid-1863. As of the early 21st century, the "rebel flag" has become a highly divisive symbol in the United States. Far right-wing political activists in the European Union, many of whom have separatist inclinations, have been known to use the Confederate flag. This is especially true in Germany, where displaying the Nazi flag in public is outlawed. Jefferson Davis State Historic Site & Museum. The Bonnie Blue Flag is on the right. ^ William Tappan Thompson, editor of Savannah's Daily Morning News, used a different nickname for the flag, calling it "The White Man's Flag," saying that the flag's white field symbolized the "supremacy of the white man." But it was a nickname that never gained traction with the public. ^ Although the officially specified proportions were 1:2, many of the flags that actually ended up being produced used a 1.5:1 aspect ratio. ^ Although the officially designated design specified a rectangular canton, many of the flags that ended up being produced utilized a square-shaped canton. ^ a b c Coski, John M. (May 13, 2013). "The Birth of the 'Stainless Banner'". The New York Times. New York: The New York Times Company. Archived from the original on January 27, 2014. Retrieved January 27, 2014. A handful of contemporaries linked the new flag design to the "peculiar institution" that was at the heart of the South's economy, social system and polity: slavery. Bagby characterized the flag motif as the "Southern Cross" – the constellation, not a religious symbol – and hailed it for pointing 'the destiny of the Southern master and his African slave' southward to 'the banks of the Amazon,' a reference to the desire among many Southerners to expand Confederate territory into Latin America. In contrast, the editor of the Savannah, Ga., Morning News focused on the white field on which the Southern Cross was emblazoned. "As a people, we are fighting to maintain the heaven-ordained supremacy of the white man over the inferior or colored races. A White Flag would be thus emblematical of our cause." He dubbed the new flag "the White Man's Flag," a sobriquet that never gained traction. ^ a b c Thompson, William T. (April 23, 1863). "Daily Morning News". Savannah, Georgia. ^ a b c Thompson, William T. (April 28, 1863). "Daily Morning News". Savannah, Georgia. ^ a b c Thompson, William T. (May 4, 1863). "Daily Morning News". Savannah, Georgia. ^ a b c Loewen, James W.; Sebesta, Edward H. (2010). The Confederate and Neo Confederate Reader: The Great Truth about the 'Lost Cause'. Jackson, Mississippi: University Press of Mississippi. p. 13. ISBN 978-1-60473-219-1. OCLC 746462600. Retrieved December 5, 2013. Confederates even showed their preoccupation with race in their flag. Civil War buffs know that 'the Confederate flag' waved today was never the official flag of the Confederate States of America. Rather, it was the flag of the Army of Northern Virginia. During the war, the Confederacy adopted three official flags. The first, sometimes called 'the Stars and Bars,' drew many objections 'on account of its resemblance to that of the abolition despotism against which we are fighting,' in the words of the editor of the Savannah Morning News, quoted herein. ^ a b Kim, Kyle; Krishnakumar, Priya. "What you should know about the Confederate flag's evolution". Los Angeles Times (June 23, 2015). California. Archived from the original on July 12, 2015. Retrieved July 11, 2015. ^ a b Allen, Frederick (May 25, 1996). Atlanta Rising: The Invention of an International City 1946–1996. p. 67. ISBN 9781461661672. Retrieved September 1, 2015. By modern standards, the greatest flaw of the 'Stainless Banner' was its other popular nickname, bestowed by William T. Thompson, editor of the Savannah Daily Morning News, who called it 'the White Man's Flag' and argued that it represented 'the cause of a superior race and a higher civilization contending against ignorance, infidelity, and barbarism' – a bit of racist rhetoric that is plainly unacceptable in current public discource. ^ a b "Confederate States of America government". Retrieved October 7, 2014. ^ "Nicola Marschall". The Encyclopedia of Alabama. April 25, 2011. Retrieved July 29, 2011. The flag does resemble that of the Germanic European nation of Austria, which as a Prussian artist, Marschall would have known well. ^ a b Hume, Edgar Erskine (August 1940). "Nicola Marschall: Excerpts from "The German Artist Who Designed the Confederate Flag and Uniform"". The American-German Review. Retrieved June 26, 2015. ^ Commemorative Landscapes of North Carolina. "First Confederate Flag and Its Designer O.R. Smith, Louisburg". Wilson Library, University of North Carolina at Chapel Hill. ^ "The Declarations of Causes of Seceding States". Civil War Trust. Retrieved February 23, 2016. Our position is thoroughly identified with the institution of slavery—the greatest material interest of the world. Its labor supplies the product which constitutes by far the largest and most important portions of commerce of the earth. These products are peculiar to the climate verging on the tropical regions, and by an imperious law of nature, none but the black race can bear exposure to the tropical sun. These products have become necessities of the world, and a blow at slavery is a blow at commerce and civilization. That blow has been long aimed at the institution, and was at the point of reaching its consummation. There was no choice left us but submission to the mandates of abolition, or a dissolution of the Union, whose principles had been subverted to work out our ruin. That we do not overstate the dangers to our institution, a reference to a few facts will sufficiently prove. ^ Coski, John M. (May 13, 2013). "The Birth of the 'Stainless Banner'". The New York Times. New York: The New York Times Company. Archived from the original on January 27, 2014. Retrieved January 27, 2014. "Every body wants a new Confederate flag," wrote George Bagby, editor of The Southern Literary Messenger, in January 1862. "The present one is universally hated. It resembles the Yankee flag and that is enough to make it unutterably detestable." The editor of the "Charleston Mercury" echoed Bagby in his criticism and in his solution: "It seems to be generally agreed that the 'Stars and Bars' will never do for us. They resemble too closely the dishonored Flag of Yankee Doodle … we imagine that the Battle Flag will become the Southern Flag by popular acclaim." As early as April 1861, critics denounced the Stars and Bars as a "servile imitation" and a "detested parody" of the Stars and Stripes. ^ Bonner, Robert E., "Flag Culture and the Consolidation of Confederate Nationalism." Journal of Southern History, Vol. 68, No. 2 (May 2002), 318–319. ^ William Parker Snow, Lee and His Generals (1867), p.260 . ^ "Gen. Beauregard suggested the flag just adopted, or else a field of blue in place of the white." -"Letter from Richmond" by the Richmond correspondent of the Charleston Mercury, May 5, 1863, p.1, c.1. ^ John M. Coski, "The Birth of the Stainless Banner," New York Times Opinionator, (May 13, 2013). "Some congressmen and newspaper editors favored making the Army of Northern Virginia battle flag (in a rectangular shape) itself the new national flag. But Beauregard and others felt the nation needed its own distinctive symbol, and so recommended that the Southern Cross be emblazoned in the corner of a white field." ^ J. Michael Martinez, William D. Richardson, Ron McNinch-Su, eds., Confederate Symbols in the Contemporary South, University Press of Florida (2000), p.98 . ^ John D. Wright, The Language of the Civil War, p.284; John M. Coski, The Confederate Battle Flag: America's Most Embattled Emblem (2005), p. 17. ^ Gevinson, Alan. "The Reason Behind the 'Stars and Bars". Teachinghistory.org. Retrieved October 8, 2011. ^ Coski, John M. (2009). The Confederate Battle Flag. Harvard University Press. p. 5. ISBN 978-0-674-02986-6. Retrieved November 24, 2016. ^ Coski 2005, p. 5: "describes the 15 stars and the debate on religious symbolism." ^ Birthplace of the Confederate Battle Flag. The Historical Marker Database. ^ "2008 Virginia Marker Dedication: Birthplace of the Confederate Battle Flag". Retrieved October 5, 2014. ^ Chapman, Roger (2011). Culture Wars: An Encyclopedia of Issues, Viewpoints, and Voices. M.E. Sharpe. p. 114. ISBN 978-0-7656-2250-1. Retrieved February 21, 2013. ^ Leonard, Ian (June 21, 2015). "What is the Confederate flag and what does it stand for?". Daily Mirror. Retrieved July 19, 2015. ^ The Associated Press (July 10, 2015). "Confederate flag removed: A history of the divisive symbol". Oregon Live. ^ Mathias, Christopher (July 14, 2017). "This Is Why You're Seeing The Confederate Flag Across Europe". huffingtonpost.com. The Juffington Post. Retrieved June 29, 2018. As President Donald Trump spoke last week in Warsaw, Poland, cable news cameras panned across the raucous crowd bused in by the country's right-wing government to cheer him on...Amid the waving red-and-white Polish flags, a lone man ― over 4,000 miles from the U.S. South, from the land of Jim Crow, the Ku Klux Klan and slavery ― could be seen holding the Confederate flag. Bonner, Robert. Colors and Blood: Flag Passions of the Confederate South. Princeton University Press, 2002. ISBN 0-691-11949-X. Coski, John M. (2005). The Confederate Battle Flag: America's Most Embattled Emblem. United States of America: First Harvard University Press. ISBN 978-0-674-01722-1. Katcher, Phillip and Scollins, Rick. 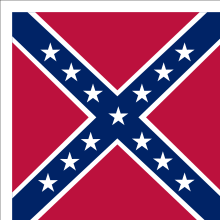 Flags of the American Civil War 1: Confederate. (Osprey Men-At-War Series), Osprey Publishing Company, 1993. ISBN 1-85532-270-6. Marcovitz, Hal. The Confederate Flag, American Symbols and Their Meanings. Mason Crest Publishers, 2002. ISBN 1-59084-035-6. Martinez, James Michael; Richardson, William Donald; McNinch-Su, Ron (2000). Confederate Symbols in the Contemporary South. Gainesville, FL: University Press of Florida. pp. 284–285. ISBN 0-8130-1758-0. Preble, George Henry (1872). Our Flag: Origin and Progress of the Flag of the United States of America, with an Introductory Account of the Symbols, Standards, Banners and Flags of Ancient and Modern Nations. Albany: Joel Munsell. OCLC 612597989. Preble, George Henry (1880). History of the Flag of the United States of America: And of the Naval and Yacht-Club Signals, Seals, and Arms, and Principal National Songs of the United States, with a Chronicle of the Symbols, Standards, Banners, and Flags of Ancient and Modern Nations (2nd revised ed.). Boston: A. Williams and Company. OCLC 645323981. Wikimedia Commons has media related to Flags of the Confederate States of America.